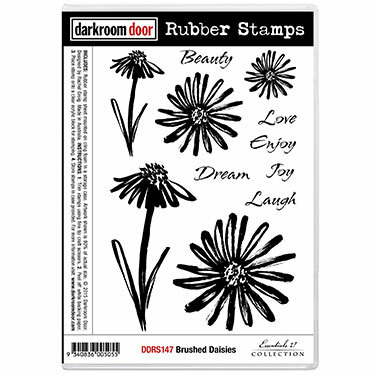 Stamp out the large Daisy in black ink and cut it out. That will be the mask for the Daisy when the background is stamped. Ink up large Daisy stamp with ink marker pens and stamp on cardstock. Cover stamped image with mask and stamp the Polka Dot background directly on top of mask. That will give you the Polka Dot background without disturbing the Daisy. Mat on cardstock. Add zig zag stitched border to bottom of card. Add sentiments and rhinestones to the center of the Daisy. 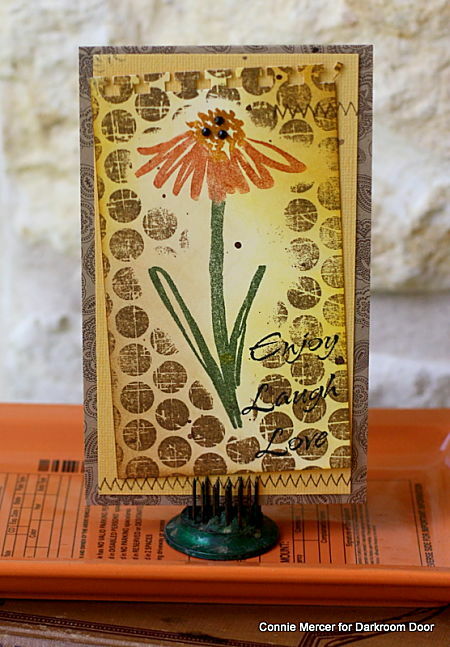 More inspiration using the Brushed daisies set can be found on Darkroom Door's blog. So gorgeous! LOVING that flower!! Have fun with the grandkids!!!!!!!! pretty card.. i love that big flower. What a delicious card - love the coloured stamping. Love those flowers!!! Beautiful card!! !